Later by Philip Gross, Bloodaxe Books, 2013, 978-1-85224-979-3, 80 pages. The Other History: or unreported and underreported issues, scenes, and events of the 19th, 20th and 21st centuries by Scott T. Starbuck, FutureCycle Press, futurecycle.org, 2013, 978-1-938853-41-8, 39 pages. 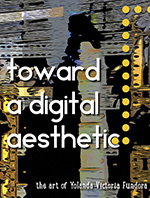 Towards a Digital Aesthetic: The Art of Yolanda Victoria Fundora by Yolanda V. Fundora, UrbanAmish.com, 2014, 978-1-49615-583-2, 122 pages. During the past reading period, three titles have come to my attention, which I feel are relevant to AQ10’s theme of the earth, ecology and the future. The first two are books of poetry with environmental and philosophical themes and the third is a book about digital design which contains the artist’s/author’s images from both the natural and man-made world. The first book, Later, is by 2009 T.S. Poetry Prize winner and English nature poet, Philip Gross, who is featured in an in-depth interview in this issue. In Later Gross continues his poetic explorations into his father’s failing health and death (the first 34 pages of the book) within the context and the limits of land, water, sky and language. To say, however, that this first section is just devoted to his father, however, would be misleading. In fact there are also poems about natural landscapes, political change and language. In the first poem, “Flying Down Wales,” Gross describes Wales’ mountains as a“knobble-/back spine” and “surly wrinkles.” The next poem, “Home, 1990,” describes the effect that the end of communism and the lifting of the Iron Curtain had on refugees from Eastern Europe (and their families). “Come, you can come home now,” but instead the poem’s narrator looking into his father’s mind concludes: “Estonia was safe here, inside of you.” “Variations on the Theme from the Cornish” is as much a poem about language and culture as it is about Gross’ father’s decline. To be sure there are poems almost exclusively devoted to Gross’ father’s illness such as “Stroke Ward,” “In High Care,” “Step,” “Survivor,” “Fall,” and especially “Birch his Book” which describes Gross’ father’s aphasia. Since some days I can type better than I can speak due to my MS, I think I understand a bit of Gross’ and his father’s frustration. Gross describes very well the situation where “few things and fewer each day answer to their names” and how he tries to teach his father the tree’s name, (a birch) as his father did for Gross when he was a child. The ambitious, eight-part poem entitled “Spoor,” (Dutch for train tracks or rails), mixes a journey to The Hague with his father’s physical decline and it relationship to his damaged neural network. I know very well the effect of the “blood shadow/ of stroke damage” and the “Scuff marks” in the brain that sometimes causes unexpected hesitations in my conversations due to my inability to find the right word or even substitute a simpler one. While I’m struggling, there’s also the added frustration of people finishing my sentences. His next poem, “Goal,” uses the same method but in reverse. This time Gross starts with a pub crowd watching a football match: “goal! has lifted them clean off their bar stools/ and out of themselves/ their mouths wide, like one full-on/ gust of wind; there may be words / and somewhere, losers.” Two stanzas later, Gross compares this feeling of happiness with “launched/ like a toddler from a rough grip” and ends the poem in an expansive direction: “great laughter/like God’s….” The natural world, most especially the wetlands and seaside, remains the prominent setting for his poems, yet, I can’t help feeling personally that after he has worked through his father’s death, (perhaps the real Later of this book) Gross begins to notice and embrace the vibrant social world around him and integrate it within the big picture. Other favourites of mine in this collection are the literary “Glosa, Westron Wynde,” the technically-interesting, delicately-balanced, concrete poem “Whit” and the biographical poem, “Dirac, The Tower,” about the theoretical physicist, Paul Dirac. It so satisfying to see a poet successfully address so many subjects simultaneously, and to do so by employing simple lines that seem to float effortlessly down the page. With this approach, Gross writes poetry with a great reach and accessibility without calling attention to the himself as observer, but rather to his subject matter. 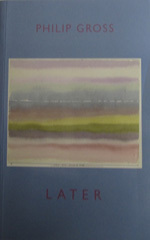 Lastly, I would like to mention that the beauty and simplicity of Later is also reinforced by its cover design: a very tasteful, blue-grey colour inset with Paul Klee’s painting, “North Sea, 1923,” à lá Turner with its horizontal bands of light pink, gray, green, purple, yellow and one of blue three quarters towards the top of the painting, suggestive of a coastline. 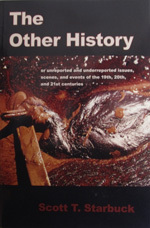 In contrast to the subtle beauty of Later’s cover, the cover of Scott T. Starbuck’s The Other History: or unreported and underreported issues, scenes, and events of the 19th, 20th and 21st centuries features a dead duck covered in spilt oil. Similarly, Starbuck’s environmentally-concerned poetry doesn’t pull any punches. It is political, yet doesn’t fall into the standard trap of being purely polemic and/or programmatic. Starbuck reaches to find new images to discuss events in American history that many are ignorant of either because they have been suppressed or ignored such as the removal and/or extermination of indigenous American peoples, the pollution of their once bountiful, pristine land and, until the Obama presidency, climate change. This is good, environmental-activist poetry reminiscent of Allen Ginsberg’s anti-nuclear poems, but sharper and quicker to the point. The Other History is soul-stirring and pragmatic and could be used to educate students about human and environmental disasters/atrocities not usually covered in standard high school/second-form or college/university textbooks. It’s heartening to see that 19 of this slim collection’s 29 poems have appeared in 19 literary and/or artistic venues. That said, it’s a shame that none of The Other History’s poems have been published in more mainstream publications like The New Yorker or The Christian Science Monitor. As a result, Starbuck’s poems may never reach the audience they deserve and thus, also will be less effective in initiating real change. Her book, (which, like Starbuck’s, is available in both printed and digital formats) is divided into six parts: an introduction followed by her digital images grouped under the headings “Cityscapes,” “Landscapes & Trees,” “Abstraction & Symmetry,” “Musings and Ruminations” and “Noteworthly Floralities.” Four of her five paintings on display in this issue come from the first section. These include her bifurcated and partially denatured pictures of Amsterdam’s canals and her “Cleveland Park Fence,” and her “Rooftops of Amsterdam” with its Van Gogh style/Santa Fe colour sky and clouds. The fifth painting, “Waterfall Pilgrimage at Ohiopyle,” along with her other nature paintings in the second section, reminds me of Tiffany’s stained-glass windows, especially her “Dappled” and “Jockey Hollow” tree series drawn in broad brushstrokes and seemingly backlit. Just as interesting are pieces in other sections, the “Abstraction & Symmetry” section being my next favourite, especially the paintings entitled: “Organica” featuring what appears to be almost flower-like swirls of red, white, black and light blue, “The Birth of Galaxies” featuring swirls of colour sweeping out from a single point and “Magnificat” which looks like a combination of pastel and earth colour rock strata and crystal faces. Towards a Digital Aesthetic is truly a beautiful collection. It has inspired me to try my hand at creating digital art. I’ll begin with something simple like modifying some of my Amsterdam scene photos in Adobe Photoshop to create the sliders for the AQ11 Autumn 2014 issue. I hope Fundora’s book also inspires you to take up your digital pen or brush to explore new techniques or styles to create your own visual art.